Israeli gunfire killed a Palestinian teenager at a protest along Gaza-Israel border fence, Gaza officials said Friday, as thousands in contested Jerusalem descended on a section of a flashpoint holy site that has been closed by Israeli court order for over a decade. The Health Ministry said 15-year-old Youssef al-Dayya died at a hospital shortly after he was hit with a gunshot in the chest. The circumstances of his death were not immediately known, but it occurred when thousands of Palestinians participated in protests along several sections of the frontier, with dozens approaching the heavily guarded barrier. 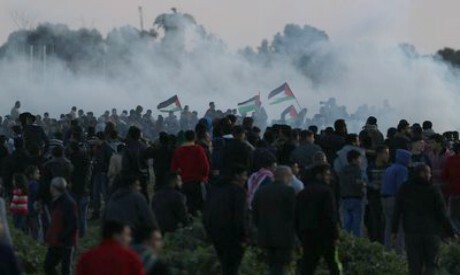 The ministry added that 30 protesters were wounded by Israeli live fire in the weekly Gaza march. The protests in Gaza are mostly against the Israeli blockade of the Hamas-ruled territory. Citing security concerns, Israel imposed tight restrictions on movements of people and goods in and out of Gaza after the militant Hamas group wrested control of the territory in 2007. Hamas has arranged weekly demonstrations since last March to protest the blockade and demand the return of Palestinian refugees to land in what is now Israel. Close to 190 Palestinians, mostly unarmed, have been killed by Israeli fire in the protests, and one Israeli soldier was killed by a Palestinian sniper last July. Israel says it defends its frontier against breaches. Critics accuse Israel of employing excessive force against unarmed Palestinians. In Jerusalem, the eastern part of which Palestinians claim as their future capital, protesters chanting ``Allahu Akbar'' streamed into a sealed-off area of al-Aqsa Mosque during prayers Friday. Israeli police said the crowds that gathered dispersed peacefully after prayers. Israel blocked off a structure near the mosque, known as the ``Gate of Mercy,'' in 2003 because it was home to a heritage organization allegedly connected with a militant Islamic group. Israeli police accused the Waqf, the Islamic authority that oversees the compound, of attempting to ``change the status quo'' at the sensitive site by convening in the closed area last week. The contested site, revered by Jews as the Temple Mount and by Muslims as the Noble Sanctuary, is at the heart of the Israeli-Palestinian conflict.